An employee resigned without serving notice period! A vital member of the project had to take medical emergency leave just a few days before project delivery. Rumors are spreading among employees that the management is biased towards some employees and that they are not treated equally. 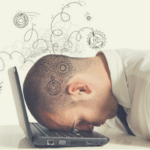 Being a business owner, you can relate to these situations, and you must have encountered some of them in one way or other. What’s is more frustrating is that you have no control, whatsoever, on these circumstances. And you certainly don’t know when one of them will strike you in the future, and STRIKE HARD! It is not just the immediate harm, but the sheer loss of time and money which you have invested in training these employees. Wouldn’t it be great to have an ultimate guide, which you can hand over to the new employee joining your company, or a new project? And before you even know it, you have averted 50% of the damage that the absence of the specific employee must have caused! Yes, there is exist such a thing! It is called Standard Operating Procedures (SOP) Manual. Whenever you hire a new employee or whenever one of them goes on leave, the most significant issue that takes its toll is employee training. Your replacement employee takes several days, even weeks, to get used to the new work process and environment. An ATD (Association of Talent Development) report states that employers spend 33.5 hours training per employee on an average. By the time the new employee is fully trained, your business suffers a great deal of loss and non-productive period. This is where SOP manuals come in handy. Want to get your magic employee guide (SOP Manual)? Contact here. Why Do You Need to Train Employees? They have better chances of leading your business to success and attract more customers. Training programs for your employees cost a significant amount of money. This can take a toll on your business, especially if you are on a tight budget. According to the State of the Industry Report released by ATD in 2014, companies spend $1,208 on an average for training each employee. For smaller businesses with less than 500 employees, the expense is even higher at $1,888 per employee on an average. the people responsible for doing them. SOPs not only save training time and money, but they also make your business more organized and structured. 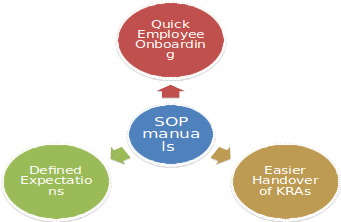 Get a comprehensive SOP Manual written by SOP Consulting experts, Contact here. 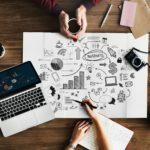 Quick Employee Onboarding: An SOP manual properly explained through an annotated illustration or flowchart makes it easier for the new employees to learn. It will significantly reduce the amount of time required for onboarding a new employee. Easier Handover of KRAs: When you hire a new employee, you need to ask other employees to take out some time from their regular duties and train the new employee. This hampers their productivity and results in business loss. But with an SOP manual, they can just hand it over to the new employees, and give them some time to study it. Since this manual contains all the necessary information, details, tasks and rules of the organization, new employees will quickly learn the company’s processes and join the company well-informed. Defined Expectation: Your employees don’t need to guess how their employer wants the tasks to be done! Whether the SOP manual is in their drawer or on the computer, they can refer to it as many times as they want, and follow the procedures mentioned in it. 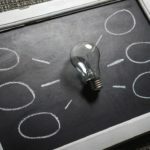 With the help of a defined routine, employees get enhanced predictability in their duties and hone their talent to improve their overall performance. 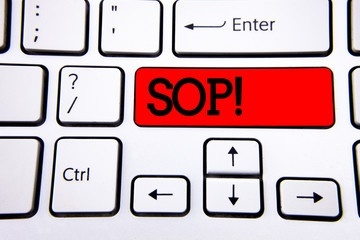 Want to know more about SOP Consulting services? Contact here. Reduced dependency on verbal communication, which is often confusing, and hence lesser chances of errors. Many companies have key employees who usually perform particular tasks. According to the U.S Environmental Protection Agency (EPA, p. 1), SOP manuals allow other staff members to complete these tasks whenever the key employees are sick or on vacation. With SOP manuals, you can determine employee success and identify deficiencies in regular performance reviews. If unfortunately, you need to terminate an employee, you can justify the termination or disciplinary action by referring to the SOP manual. With the help of SOP manuals, employees may help each other in learning new processes, instead of relying on the employers to do so. They also allow employees to correct each other when they are not doing the task correctly. A good SOP manual not only outlines the ‘how’ of the tasks, but also the ‘why’ of them. When employees know why they are performing a particular task, they are more likely to do it. An SOP manual is a valuable communication tool between an employer and an employee. But getting a good SOP manual developed is a challenging task. You can only rely on professional management consultants possessing experience in your domain to get SOP consulting, and eventually get the perfect SOP manual developed for your business. If you are looking for comprehensive SOP consulting services, you can drop a mail at [email protected] or connect at +91-9860-426-700.